Cooler, breezy weather has finally reached So-Cal with temps dipping down as low as the 40s at night (brr!) making it perfect to cozy up in my favorite sweaters and fuzzy blankets. While I love the crisp and chilly evenings and mornings, carefully planning my outfits for the day has become even more necessary since I have to take into account the ever-changing temps that manage to climb into the mid-70s and the 80s some afternoons! With this in mind, dressing in layers has been essential for me. Though I wear skirts and dresses most days (as you've seen) and genuinely enjoy getting dressed up, when I'm out and about running errands or just want to wear something easy and comfy, casual basics are my go-tos. When styling them for cooler weather, a sweater-and-boots combo is always at the top of my list. Who doesn't like wrapping themselves up in their favorite soft sweaters and throwing on a pair of jeans and boots this time of year? I think it's one of the quintessential Fall/Winter "uniforms" we've come to love and repeat year after year. And it's easy to see why. It checks all the right boxes for most of us: easy, comfy, and cute. In other words, yes, yes, and more yes! Today I'm sharing one of my favorite casual-cute pairings in winter-white, camel, and plaid. Classic, neutral colors like these are my favorite. They're simple yet pretty, and more importantly, timeless. They withstand all of the fleeting fashion trends, and can be trusted to look the same now as they did in years past or in years to come. I love that. Winter-white, camel, and plaid also work together so flawlessly, don't you think? For those of you with more minimalist-style sensibilities, this look will no doubt resonate more with you. That's because with only a few key pieces, you have a polished and pulled-together look that is also warm and easy to move around in -- the best of both worlds, style and comfort. And because the foundation pieces are all neutrals, your color choices for a topcoat expand that much more! Camel, navy, black, winter-white, red, burgundy, grey -- coats in any of these hues would look gorgeous with this outfit! The winter-white sweater I'm wearing for this look is old from LOFT, but I've found a few similar ones here, here, here (love the hem of this one! ), and here that are worth a glance if you're in need of some new ones. This camel wrap coat is a recent purchase from Ann Taylor about a month ago, and fits really well in the XXSP size, which is why I ultimately kept it, despite having bought this one from H&M beforehand (see it on me in this post.) I adore both for their varied details, including their overall length (the AT one is shorter, while the H&M one is longer and slightly dressier in my opinion.) With the rise in popularity of these wrap-style coats, I was able to find several similar camel ones here, here, and here. I've mentioned it before, but if you can purchase only one outerwear item this season, go with a well-fitting, high-quality camel wrap coat; it will instantly elevate your outfit and will last you years. These dark, "modern skinny-ankle jeans" from Ann Taylor have become a fast favorite of mine. I've had this particular pair for a couple of years now, and love the style and slightly-stretchy fit so much, I'm considering picking up this season's new variations here and here. Since I'm 5'2" the petite inseam is ideal for me (26 - 26.5"), especially when I want to wear my jeans with heels/pumps. If you're taller, the regular sizes or tall sizes may work best for you. A Burberry check scarf is such an iconic piece, and worthy of the investment if you're able to treat yourself. It definitely hits all of the "classic and timeless" notes, and will hold its value for years to come with proper care. It would make a perfect gift, too! If the price is just too much to swallow right now, try a budget-friendly option like this one, which is equally lovely and only $13! These Vince Camuto boots have been highly-praised by multiple fashion bloggers, especially fellow petites, and for good reason. They're very petite-friendly, hitting about an inch or two above the knee on someone my height, and the micro-suede is very soft and supple. They fit the legs nicely without being too constricting, which makes them easy to walk in, too. I loved these so much, I snagged the black ones during the many killer Black Friday/Cyber Monday sales. They're sleek and beautiful and will see plenty of wear during these cooler months! I plan on wearing them with dresses/skirts and tights, too! I found them on sale here for only $77, which is a steal! (Use code "FRIEND" at check-out.) I was also happy to find them in more sizes here, especially since several sizes have already sold out at Nordstrom and other popular department stores. My dome leather satchel is by Michael Kors, which I scored at my local T.J. Maxx store over the Summer. I believe it was around $120, and was worth every penny. I have worn it countless times and adore the color and clean shape so much. It's easy to just throw on your arm and go, too. And if I want to go hands-free, I just attach the crossbody strap that came with it; it's so convenient! I was able to find this nearly-identical MK bag on sale for $156 with free shipping, for those interested! 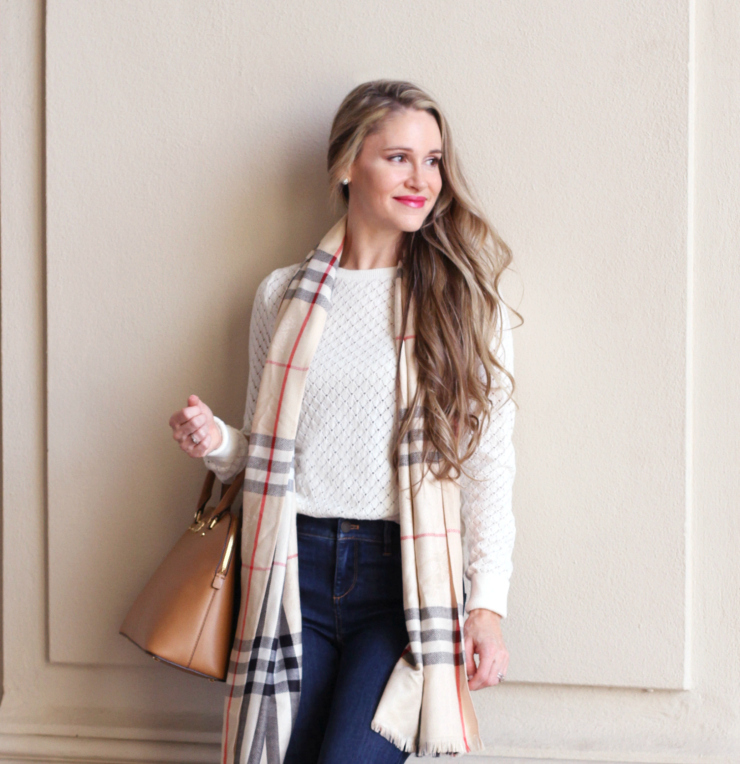 Winter-white, camel, and plaid will be a forever-favorite combo of mine for Fall/Winter! I plan on repeating it often, with multiple variations. Stay tuned for another plaid look I'm loving that's coming to the blog soon! What is one of your go-to combos this time of year?